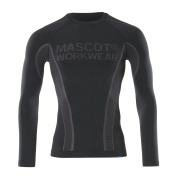 Thermal underwear from MASCOT is for the ones who need maximum protection against the cold. When working outdoors during the cold periods of the year, it is important to wear thermal underwear that can keep you warm all day. Therefore, it must be insulating, so you can stay warm, as well as moisture wicking, so you will not get wet and cold. The thermal underwear leads the sweat away from the body, and the moisture is distributed to the outside of the fabric, where it will be effectively distributed to a larger area so it can evaporate more easily, and you avoid freezing. The underwear functions as a protective layer that regulates your body temperature, no matter the weather or environment that you work in. Thermal underwear from MASCOT has no seams that can bother, and it is produced in soft and very lightweight materials, which make the comfort optimal when you work for many hours. 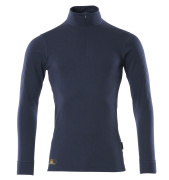 At the same time, it is available in neutral colours with nice details; you can take off the outer layer and show of the thermal under shirt if you get warm during the day. Thermal underwear from MASCOT has a tight fit that is designed according to the shape of the body. At the same time, the material is with stretch that enhances your freedom of movement.